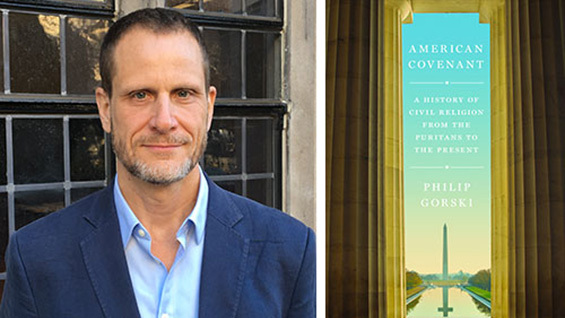 In a free, public talk, Yale sociologist Philip Gorski, discusses his new book, American Covenant in which he argues that the founders envisioned the United States as a prophetic republic that would weave together the ethical vision of the Hebrew prophets and the Western political heritage of civic republicanism. By analyzing the writing of thinkers such as John Winthrop, Thomas Jefferson, Frederick Douglass, W.E.B. Du Bois and Hannah Arendt, along with insightful portraits of recent and contemporary religious and political leaders, Gorski traces the historical development of prophetic republicanism from the Puritan era to the present day. He shows how the founders' original vision for America is threatened by an internecine struggle between two rival traditions, religious nationalism and radical secularism. Religious nationalism is a form of militaristic hyperpatriotism that imagines the United States as a divine instrument in the final showdown between good and evil. Radical secularists fervently deny the positive contributions of the Judeo-Christian tradition to the American project and seek to remove all traces of religious expression from the public square. Gorski offers an unsparing critique of both, demonstrating how half a century of culture war has drowned out the quieter voices of the vital center and along the way has imperiled the American experiment. He makes the compelling case that if we are to rebuild that vital center, we must recover the civil religious tradition on which the republic was founded.